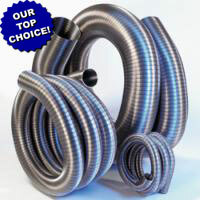 *Click herefor Flexible Liner installation diagrams. Connector-Adaptor with 2 Bands; HS Pro 8"
MUST be shipped freight truck! Tee Connector; 24GA Black 304 SS 8"